The ML4C are miniature non-reversible temperature labels. 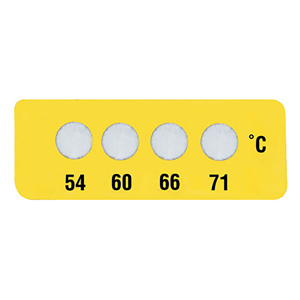 Each label contains 4 dots with different temperature ranges. Upon reaching the rated temperature, the dot will change color. Even though the temperature may drop, the dot will retain the color change as a permanent indication that the temperature was reached. Note: Insert -10” for package of 10 or “-30” for package of 30.